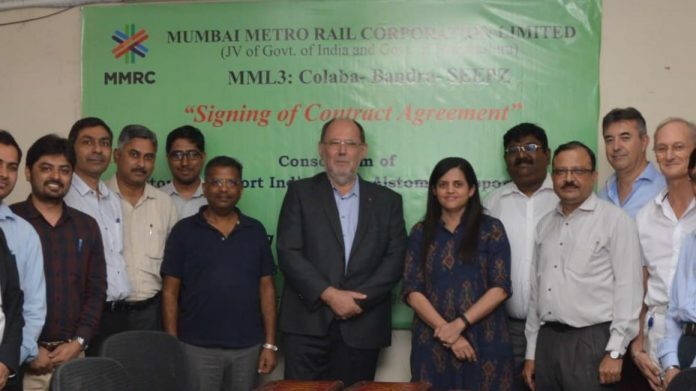 The Mumbai Metro Rail Corporation Limited (MMRCL) has awarded Alstom a contract worth approximately €315 million to supply 248 metro cars for Mumbai Metro Line 3. The French manufacturer is also executing metro projects in Chennai, Kochi and Lucknow. However, the latest deal is its biggest yet in India within the urban rolling stock sector. Design, delivery and commissioning for 31 eight-car trainsets is covered in the contract. Alstom will also be responsible for training operational and maintenance staff for Line 3. The trains will be equipped with regenerative braking and will be the first UTO (Unattended Train Operation) project in Mumbai and the second in India after Delhi Line L7/8. While the designs and development of the metro cars will be completed by Alstom’s Bangalore engineering centre, the 248 metro cars will be manufactured from its rolling stock manufacturing unit at Sri City in Chennai. Line 3 is a 33.5-km long underground stretch connecting the busiest and congested regions in Mumbai – one of India’s fastest growing cities. It will connect Cuffe Parade business district in the south of the city to the Santacruz Electronics Export Processing Zone in the north-central with 26 underground and one street-level station. The sub-terrestrial line, the first underground metro line in Mumbai, will provide a much-needed relief to the strained surface transport network and increase mobility across the region.